Making it clear that the Ayodhya issue would be one of the main campaign agenda in the Lok Sabha poll, BJP president Amit Shah on Friday said the party was committed for a “Bhavya Mandir” and declared that the “2019 battle” between Narendra Modi and his “desperate opponents” would be a decisive one and with a massive impact on coming times. Addressing thousands of delegates attending the two-day National Council meet here, Shah asked party workers to ensure that Modi returns to power with full majority and continues the “nation building” without a break. The tag line of the Council was “Abki baar phir Modi Sarkar” and the meeting venue reverberated with a loud roar when Shah mentioned Ram Mandir in his speech. The meet was attended by almost all top party leaders, including Modi, LK Advani, MM Joshi, Rajnath Singh, Sushma Swaraj, Arun Jaitley, JP Nadda, Chief Ministers of BJP-ruled States, including UP’s Yogi Adityanath, and former Chief Ministers Shivraj Singh Chouhan and Raman Singh. Yogi was greeted with loud cheers by the BJP Council members when he arrived at the stage. The backdrop of the dais had Modi and Shah on the two sides along with Swami Vivekananda and Atal Bihari Vajpayee. In his speech, Shah praised the leadership of Atal-Advani which established and contributed to the rise of the party at the national level, he said. Shah said the BJP is committed for a “grand temple” at the disputed site in Ayodhya and it would be accomplished “at the earliest”. He accused the Congress of trying to delay the temple and gave reference of its leader Kapil Sibal, who, he said, sought that the SC’s hearing on the Ram temple issue be fixed after the Lok Sabha polls. Attaching huge significance to the result of 2019 general elections, Shah said it would be a battle between Modi, who has brought “glory” to India, and his desperate rivals having contrasting ideologies glued together with the sole “oust Modi” agenda. “Opposition parties know that alone they cannot defeat Modi,” he said. Interestingly, the BJP president while pointing to the significance of “2019 LS battle” made a reference to the third battle of Panipat between Afghan ruler Ahmad Shah Abdali and Marathas where the defeat of the latter led to “gulami” (slavery) for 200 years. “Lok Sabha polls are battle of two ideologies: BJP stands for cultural nationalism, poor, while rivals together merely for power,” said the BJP president. Shah also threw punches on the “one family rule” and its alleged rein of corruption. He said the Congress was leveling charges in the Rafale jet fighter purchase as it was “frustrated” that there was no blemish on Modi during his full tenure. 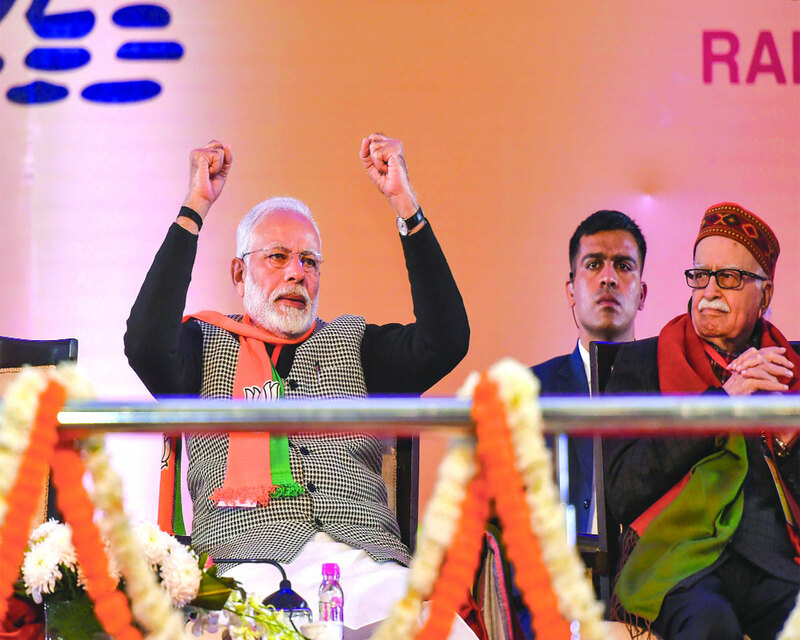 The election result would impact the future of India, he claimed and went on to say that National Democratic Alliance (NDA) would come back to power with a thumping majority and in UP “the party would increase its tally from 71 to 74”. Shah said in last one week, the Modi Government took two major decisions of giving reservation to economically weaker sections in the general category and providing Goods and Services Tax (GST) relief. The Modi Government has “fulfilled” the dreams of crores of youths with 10 per cent reservation in jobs and education for the general category poor, Shah said and described the Constitution Amendment Bill as one of the most important Bills passed by Parliament. Shah hailed the GST Council’s decision to double the limit for exemption from payment of GST to Rs 40 lakh and announced that the higher turnover cap of Rs 1.5 crore for availing composition scheme of paying 1 per cent tax will be effective from April 1. Modi would deliver the concluding session of the council on Saturday.